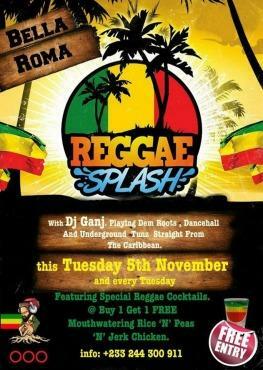 Bella Roma, Reggae Splash, Accra, Ghana. With DJ Ganj playing Dem Roots, Dancehall and Underground tunes from the Caribbean every Tesday at Bella Roma. Try the special reggae cocktails (buy one get one free). Food includes typical Jamaican cuisine – rice, peas and jerk chicken.